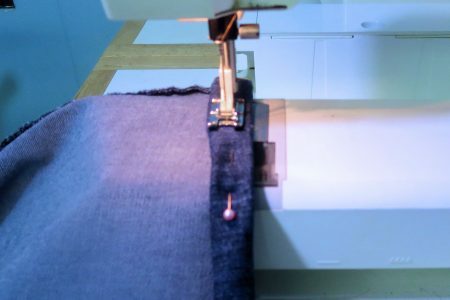 Hemming jeans does not have to be difficult. It’s actually a very simple process. 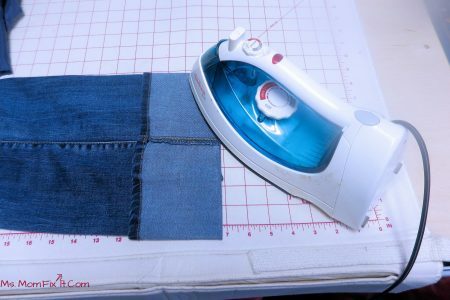 The following picture tutorial will guide you through step-by-step everything you need to know to make hemming jeans a breeze. 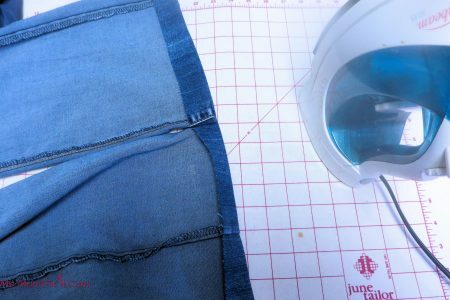 A successful hem will be dependent on the leg style of the jeans you are attempting to hem. The best hems are going to be achieved on straight-leg or boot-cut blue jean styles. Bell bottom styles have a very obvious outward angle that makes it difficult to achieve a professional appearance if you are inexperienced as a seamstress. 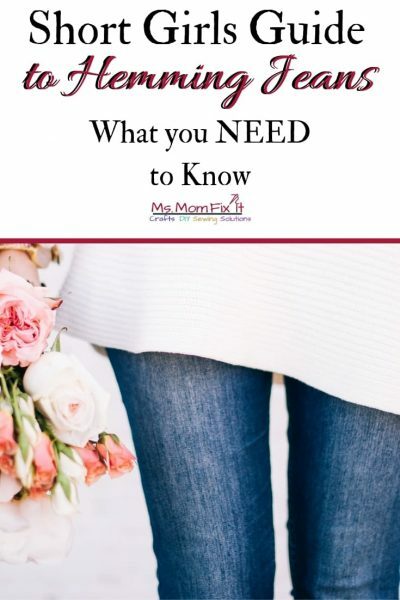 Similarly, the slimmer the jean is around the ankle the more difficult it will be to replicate a shorter version without taking in the existing seam. The type of fabric will determine the type of stitch used. At one time, jeans were 100% cotton in which case you would just use a standard straight stitch. Most modern jeans have a percentage of lycra or spandex in the mix so that they will conform nicely to the wearer’s figure. However, this also means that a standard straight stitch would pop right out when any stress is put on the seam. Thus, you will need to use a reinforced straight stitch or another stretch stitch. 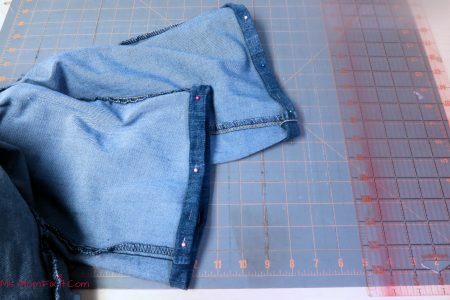 If possible, use a denim needle as it is specifically designed for jean fabric. The thicker the fabric, the thicker your needle should be. Most modern jeans are not as thick as the older all cotton fabrics. Thus, a standard 90/14 Denim needle should work great for most store-bought blue jeans. 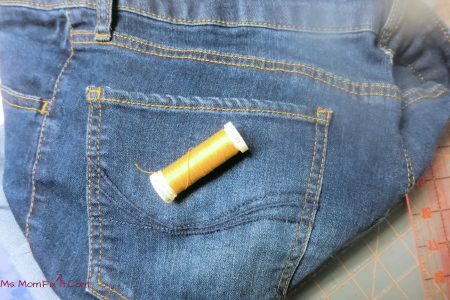 The thread should match as closely as possible the color of the accent thread on your jeans. Gutermann 870 is a great choice to match most goldenrod threads. The first thing you want to do is launder your new jeans! 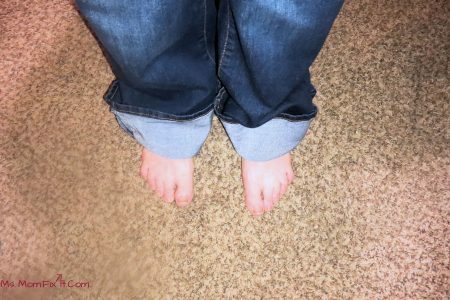 This is important to ensure there will be no additional shrinkage once you have hemmed your pant legs. Although shrinkage isn’t as much of a problem with blended fabrics, there is always a risk. Next, try on your new jeans and fold the bottoms to the desired length. I tend to wear my boot-leg jeans with boots. I know- who would have thought! Thing is that most of my boots have a slight heel so I like to have the jeans long enough to touch the boot top. This means though that they will be slightly longer when were flats like sneakers. Your jeans=your choice. Use a few straight pins to hold the length in place before removing your jeans. I pin on the side seams of either side. Now we are going to straighten out the pinning. Lay your jeans on a flat surface and adjust your fold on one leg so that it is even from front to back. Next, lay the second leg on top of the first leg. Be careful to make sure you have the crotch lined up properly so that both legs are laying even. Otherwise, you will end up with a shorter leg. Use your iron to press the fold. Ironing the fold gives you a clear line to adjust your seam. Next, we will use our cutting mat and rotary cutter to cut off the excess fabric. I recommend leaving 1 1/4 inch of fabric below your pressed fold. If you have less than 1 1/4 inch of fabric before the factory seam, this method is not optimum. Once we have cut off the excess jean fabric, turn your jeans inside out. Fold up the fabric below your already pressed line and re-press this seam towards the inside of the leg. We are going to begin folding the seam inward. To start, I like to pin the first section with just 1 layer. In the picture below, you can see a single fold of fabric raising up to the pressed fold. Once this first section is in place, it’s easy to double it over for the next section. 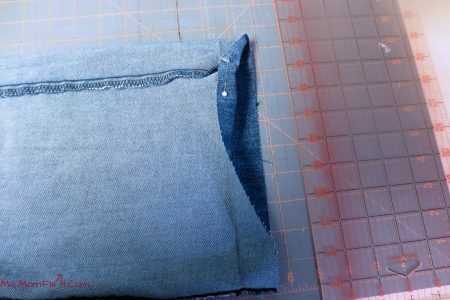 Continue the double fold around the pant leg until you reach the first area where you made the single fold. Remove the original pin holding the single fold and complete the double fold for the entire leg. After pinning both legs in this manner, lay your pants flat on your surface yet again. Make sure that both legs are the same length in relation to the center crotch seam. Now, you can move to your sewing machine. As mentioned earlier, it’s best to use a thread with matches your blue jeans seams and to also use a denim needle. You will need to have access to the free arm feature which often requires removing the accessory tray. I recommend starting your seam on the inside of your leg to hide any imperfections in starting or locking in your stitches. 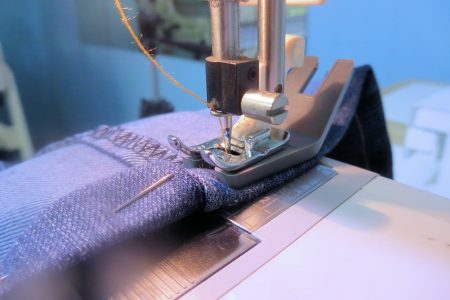 Remember with any sewing you need to lock in the stitches which can be done by simply sewing a few stitches, switch to reverse for the same number of stitches, and then sewing forward again. Your double fold will be approximately 1/2 inch thick and you can use the guide of the throat plate to ensure you keep the seam straight. You should easily be able to stitch around to the next side seam. However, the side seam suddenly becomes 9 layers of denim rather than the 3 we’ve been working with. For this, I highly recommend using what I refer to as a hump jumper (pictured below). Simply, put your needle down into the fabric. Raise your presser foot and insert the hump jumper under the presser foot before lowering the foot. The hump jumper helps even out the pressure against the needle to prevent breakage. 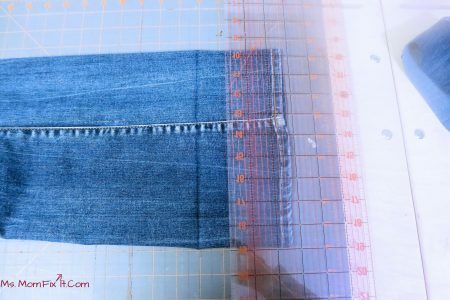 You should now be able to sew easily across the side seam. However, due to thickness, you may have to go slower depending on your machine’s power. The hump jumper will often fall right off as you sew or you can remove it manually. Continue to sew around the pant leg until you reach the inside seam and follow the same process with the hump jumper. Repeat the entire process on the other leg. Voila! 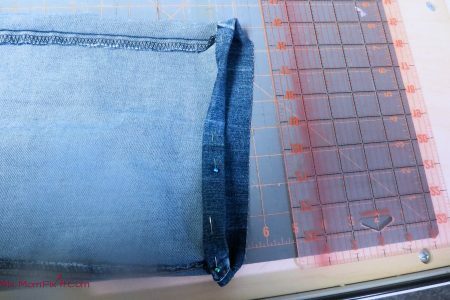 You should now have a pair of perfectly hemmed blue jeans. Let me know how you did!